The DSW Molded Plastic Side Chair Wooden Dowel Base – with the acronym 'DSW' standing for Dining height, Side chair shell, Wooden dowel base – is a slight adaptation of the original DSW side chair. It has the same distinctive organically shaped polypropylene shell and Eiffel-tower inspired base, with a slightly simpler silhouette. This delightful chair ideally complements the contours of the body, and is an equally popular choice for either the home or office. White walls and bright decor are perfect for everyday living, especially when it comes to the small space studio. 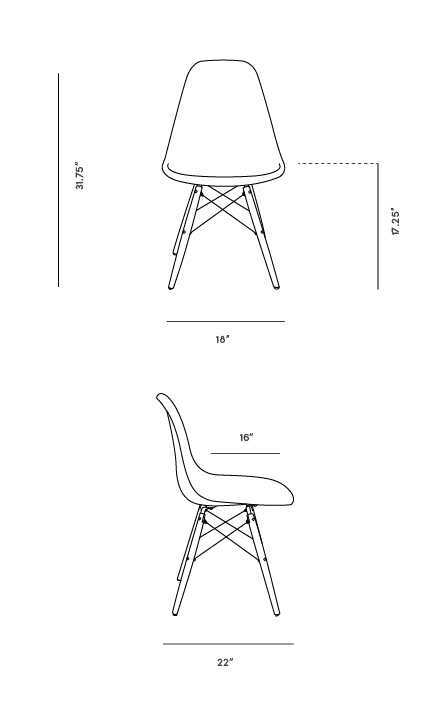 Great chairs - easy to assemble. Good value for the money. Clean and simple design. Clean, modern design with reasonable prices. Chair looks great but the plastic seat material feels slightly more plasticky than I had anticipated. The chairs were also not packed very securely - the base of the chair was just placed into the box without anything underneath, so by the time it arrived, there a hole where the chair leg had broken through the cardboard box. Luckily there wasn't any serious damage, but I would have expected a bit more padding to prevent this. Assembly was finicky but not difficult. Chair legs also expand out a little when you sit in them, so I feel like I should get a rug to make sure the chair legs don't scratch up the hardwood floors.